LAKELAND – Rev. Pam Carter knows the power of United Methodist Women. When she was active in ministry at Providence UMC in Charlotte, N.C., before coming to Florida, she saw UMW members transform a bleak pocket of the world through ministry and mission. “I’ve known one… who ended up feeding thousands and thousands of hungry children and developing a [medical] clinic to treat many others,” she said, referring to the founder of a mission to Haiti that has endured for 30 years. She remembered another who thought she couldn’t raise $1,500 for a microcredit lending program to help impoverished women in Haiti start businesses, but that program has grown to $60,000 or more in funding. Through ministry like that, “I think people understand what they can do, and what kind of impact they can have even if they don’t go to a foreign place,” Carter said. Rev. Pam Carter, surrounded by artwork from Haiti, discusses her experiences in that island nation hard-hit by poverty and natural disasters. Photo by Susan Green. Carter is the keynote speaker for the Florida Conference UMW Annual Meeting scheduled for Nov. 2 at First UMC, Lakeland. The theme of the gathering will be “Are You Living Sacramentally?” The registration deadline is Thursday, Oct. 10. On-site registration will be available but will not include lunch. Check-in will begin at 8 a.m., with the program starting at 10 a.m. While at the church in Charlotte, Carter became deeply involved in mission work in Haiti. She serves as mission interpreter of Encounter with Christ in Latin America and the Caribbean, which receives support and funding from the General Board of Global Ministries. She also is president of the Haiti Mission Foundation that oversees UMC missions in Cap Haitien, Haiti. She has conducted a study of Haiti for the UMW “Mission u” program in North Carolina. Carter is an ordained elder in The United Methodist Church. Before coming to Florida with her husband, Bishop Ken Carter, in September 2012, she was appointed as mission specialist for the Western North Carolina Conference. She also has served at the local church level and as a campus minister. For the UMW meeting, Carter said she plans to focus largely on her experiences in Haiti, including her survival of a massive earthquake that devastated the island nation’s capital, Port-au-Prince, where she happened to be attending a planning meeting with others in mission work. 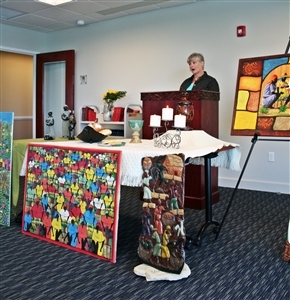 She also recalled the vital work of UMW members at Providence UMC when refugees from areas hit by Hurricane Katrina, one of the deadliest storms in U.S. history, poured into Charlotte. She said the women worked with local social service agencies to outfit the evacuees’ housing with dishes, beds and other furniture needed to make the homes comfortable. They also helped the newcomers find jobs. In addition to the keynote speech, the Florida UMW is expected to elect officers, including a new president, at the annual meeting. Members will also discuss changes to the UMW standing rules. When Rev. Dr. Sharon Austin peeked into the dining hall at the Florida Conference United Methodist Women’s “Mission u” in July, she was struck by the range of ages, ethnicities and cultures she saw there. 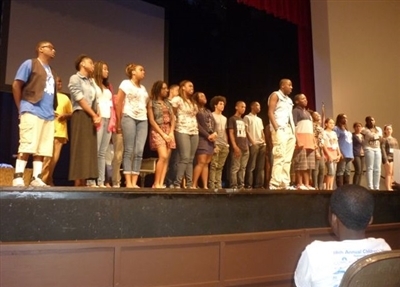 “I saw many young people of color,” recalled Austin, who became director of Connectional Ministries for the conference in July. She said she will encourage conference leadership to explore the ministry’s methods of attracting participants from all walks of life. Nelida Morales will be stepping down as after four years as president. A lifelong Methodist, Morales said she can’t remember when she wasn’t a part of UMW or a similar women’s organization in her native Cuba.She has held several leadership positions with the Florida Conference UMW and expects to remain active after a new president steps to the helm. “I don’t think I will ever be out because it’s in my blood,” Morales said. She said being UMW president has had its ups and downs, but she has enjoyed being part of the big picture of missions, local and global. During her tenure, she has represented the Florida Conference chapter at national meetings and on conference calls with leaders from the General Board of Global Mission. When she first came to the United States in 1968, initially settling with her husband, Felix, in Detroit, she spoke limited English. She said she was unable to find a Methodist church in the Detroit area that offered services in Spanish,so she and her husband started a Methodist small group for Spanish-speaking people. Since coming to Florida in 1976, she has been an enthusiastic supporter of reaching out to newcomers of different cultural backgrounds. The Florida UMW organization has a strong record of working on social justice issues, she said. This year’s annual meeting is the first in recent memory that will have both a Florida bishop in residence and his wife participating, Morales said. Bishop Carter is expected to celebrate communion at the event. Nonmembers are welcome to attend the meeting and find out more about UMW’s work. For information, click here or email jshawley174@embarqmail.com.